In the coming months, an unnamed manufacturer will bring an electric car to market that offers wireless charging from WiTricity, Alex Gruzen, the company’s chief executive, tells IEEE Spectrum. Unnamed, yes, but not utterly un-guessable. Among the companies that have demonstrated wireless charging are BMW and Hyundai. And, though there are other wireless charging companies out there—Qualcomm, for example—Hyundai has explicitly named WiTricity as the supplier of the system it showed on its new Kona EV last week at the Geneva Motor Show. Other companies known to be working with WiTricity include Honda, Nissan, and Toyota. 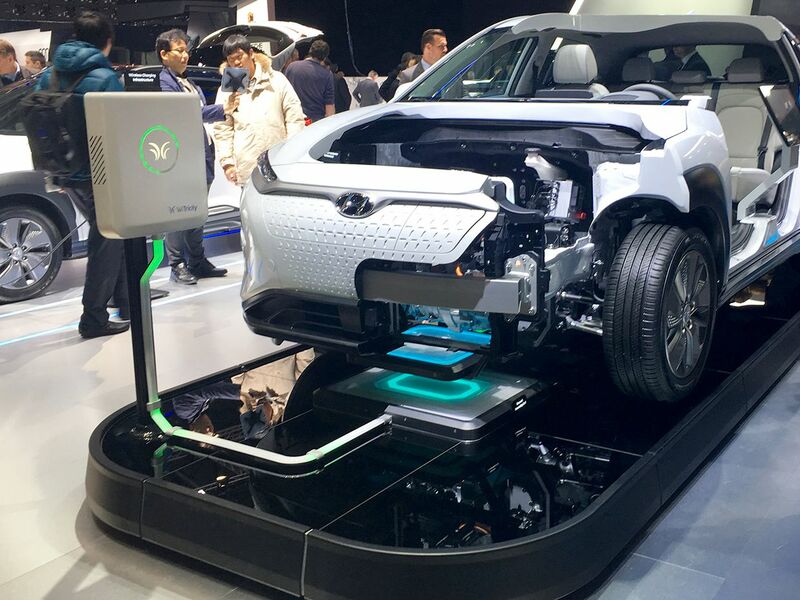 A Hyundai Kona recharges with WiTricity’s wireless system at the 2018 Geneva Auto Show. Magnetic resonance was developed at MIT in the early 2000s. It works by establishing a kind of duet between an oscillating magnetic field in a pizza-box size charger on the floor and a receiver mounted under the car. The charger and receiver are tuned to resonate, which is why little energy goes astray, making transmission as efficient as you’d get from a cable. The resonance also gives you a certain leeway in aligning the car and the charging plate. The vertical clearance can be as little as 10 centimeters (4 inches), for a sports car, and as much as 25 cm, for an SUV. The left-to-right positioning need be only within 10 cm of dead center. The fore-and-aft error—which is easier for a driver to control—is 7.5 cm. Drivers shouldn’t take long to get the hang of parking close enough to the charger on the first try. That ease of use is the entire point. So wireless charging for EVs isn’t just a trick; it’s a marketing necessity. And for it to catch on, it’ll have to be affordable. Gruzen says it costs US $800 for a complete set—that is, for the receiver on the car, the transmitting pad, and the charging unit that connects to it. And, if the product comes to be offered as a standard feature in cars, it might add just $300 or so to the price of the car. I ask him why anyone would want a slow-charger at a parking spot when he can have access to fast-charging stations, such as the ones Tesla’s building. He says there simply won’t be enough grid capacity to supply power to enough fast-charging stations once EVs throng the roads.